Flurry of Blows and Quarterstaff. I don't think Flurry of Blows is working with Qstaves for Monks. Equip stave, AB increases by 2 (no enchants on staff). attack, 3 attacks per round. Stay with fists. AB decreases by 2 (as expected). attack, 4 attacks per round, 2 in the first flurry. I think indomitable soul simply does not work. The point of the feat is that you roll twice for a will save, and the higher one is chosen. It's sort of like Slippery Mind, but built around the Man-at-Arms class, because I haven't seen it available for any other class. Well...it just seems to ignore the second roll if it suceeds and treats your initial roll as though that's that. I'll try and catch this in action and see if I can screen a good example. It seems to even fail to work when saving to end a status effect. I had multiple *success* rolls, but they didn't seem to help end status effects. Not to be confused with indomitable will, which seems to work just fine. Although perhaps the "breaking" occurs when you have both feats and it secretly continues to use wisdom to determine a will save even though it should be using constitution? 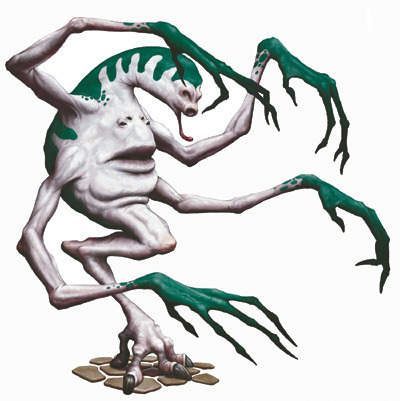 - which would be terrible because the two feats really make playing a non-magical melee build viable against some of the high level caster mobs. The druid/spririt shaman spell Rejuvenation Cocoon removes 2 AC from my Dwarven Battlerager (5 levels in it). i guess it removes the +2 AC bonus for being Battlerager 5. It lasts until i rest. I took the Augment Summoning Feat on my Druid and summoned a Fire Elemental with Summon Creature IX. The Strength and Constitution bonus from the feat applied to the summon for about 5 seconds, but then deactivated after about 5 seconds. The bonus to Strength and Constitution was also only +1, not +4, as the feat states. If this feat is not fixed, I'd like a DM to roll me back to level 18 so I can take a different feat. BioWareFan37 wrote: I took the Augment Summoning Feat on my Druid and summoned a Fire Elemental with Summon Creature IX. The Strength and Constitution bonus from the feat applied to the summon for about 5 seconds, but then deactivated after about 5 seconds. The bonus to Strength and Constitution was also only +1, not +4, as the feat states. 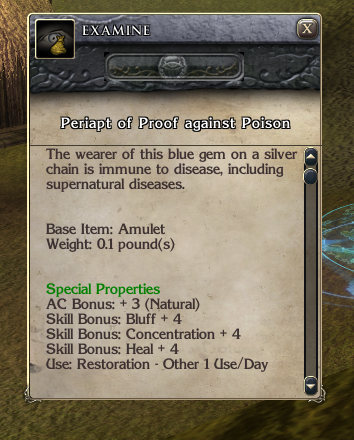 The item from Beregost misc shop "Periapt of Proof Agains Poison" lists that it has "Restoariation - other 1/day" but after using it, it does nothing. Also the description isn't really matching the effects. Can we fix where we think orcs have eyes? Awaken Blood, Blood Walk (burst forth), Blood Walk (normal) and Mark Person all seem to share the one use per day instead of a 1h cooldown for Blood Walks and no CD for mark person. They are also considered "mind influencing" for some reason. Blood walk burst forth and blood walk normal do share the one use per day but not blood mark, and I can't find any "mind influencing" descriptor either, are you sure ? Why would cost change because of blood magic ? The wording on Blood Magus' Blood Component feat begins with "Specifics: A blood magus may use a drop of his own blood as a spell's material component." Feature, not bug. If it continues to be a problem you could adjust the wording on the feat for clarification. Arivain - A man of guts and bravery, after all. Ward Williamson - "(expletive) insane." Druid Spell Frost Weapon stopped working after one of the last updates. The spell is cast, it appears in your list of spells you can dismiss. But the damage effect is not added to the weapon. The spell affect (glowing blue) does not appear on the weapon.